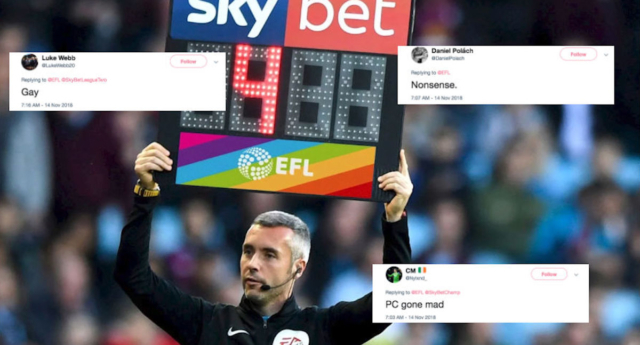 Homophobic Twitter users aren’t happy after the English Football League announced a series of rainbow-themed initiatives. On Wednesday (November 14), the English Football League (EFL) revealed that its 72 clubs across the country would use rainbow substitution boards and corner flags in a show of support for LGBT+ inclusivity in the sport. The initiative will raise awareness of Stonewall’s Rainbow Laces campaign, which promotes LGBT+ equality in sport by encouraging sports players to wear rainbow laces. It’s the second year in a row that the EFL has shown support for LGBT+ inclusivity. There are still no openly gay players in the top four tiers of English football. Clubs in the EFL will select a fixture between November 24 and December 1 to put on a Pride-themed display for LGBT+ fans, players and staff. Players will also wear rainbow laces and the captain will don a rainbow armband. The EFL will also give its logo a rainbow-inspired makeover and will release short videos sharing the stories of LGBT+ fans. EFL chief executive Shaun Harvey said: “We are hoping our specific Rainbow Laces initiatives this year, which includes new rainbow substitution boards as well as converting all corner flags at EFL grounds into rainbow colours, will again grab the attention of football fans up and down the country.